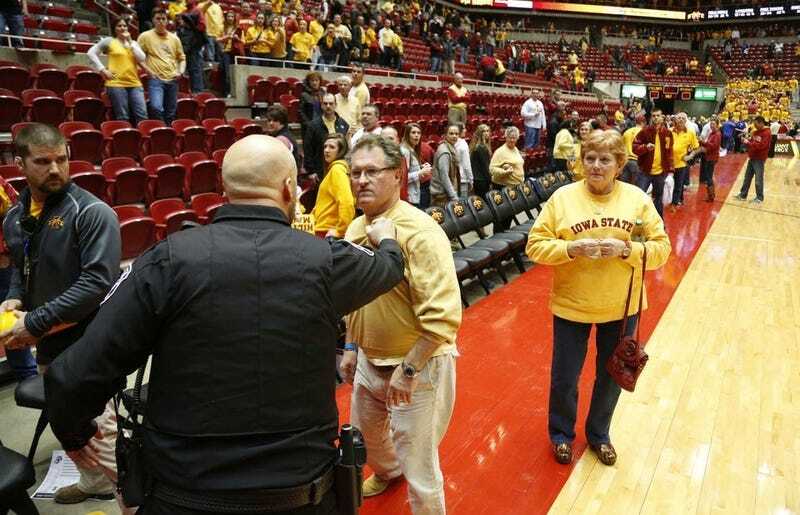 According to various accounts from the end of Kansas's 108-96 overtime win over Iowa State, a fan attempted to rush the court and confront Kansas head coach Bill Self. The game was already mildly controversial after a puzzling block or charge no-call on an Elijah Johnson drive in the final seconds of regulation. It was immediately followed by a hold foul called on Iowa State after Johnson's shot missed and the ball bounced loose. The resulting free-throws tied the game and sent the teams to overtime. The whole sequence is now under review by the Big 12. Then, with just two seconds left in overtime and a Kansas win in hand, Elijah Johnson drove for an uncontested dunk, angering the crowd even further. All this presumably built to a tipping point for many fans—several people in the student section reportedly threw plastic megaphones at the Kansas players as they left the court—including the man above who needed to be restrained by police. At around the :13 mark of the video below, when the camera angle shifts, you can hear the crowd begin to boo and people in the background reacting to, and gesturing toward, something on the court. When watching it in real time it seemed the crowd was just booing Johnson and Self, but with this context it seems probable they were reacting to the confrontation. Self earned his 500th victory and shrugged off the incident.